It’s fun and easy to grow gorgeous trailing hanging tomatoes in baskets! Find simple wire baskets (12” or 14” in diameter) in garden nurseries, hardware stores, and home improvement centers. Or find another hanging pot or basket. Just make sure it’s as deep as possible. Many hanging tomato baskets come with coconut fiber liners. Or purchase your own liner – they’re easy to find and fairly inexpensive both at local stores and through online retailers. Some gardeners use peat moss to line their baskets, but it looses its shape and falls out of openings between basket wires. Coconut fiber, also known as coconut coir fiber or moss liner, is made of pressed coconut fibers found in the hard, internal shell and outer coat of a coconut. It’s easier to work with than peat moss because stays together even if cut and fitted into any size basket. Coconut fiber is available in formed liners and rolls. You can re-use baskets from year-to-year. Some gardeners re-use liners, too, but be careful – diseases can transfer from season to season. Tomatoes with shallow root systems do better in baskets than varieties with deep root systems. Foliage in baskets won’t grow tall, but is attractive when it sprawls and tumbles over basket sides. Look at this list of best tomato varieties for baskets to select one that works well in that kind of container. Don’t use garden soil. It dries out too fast. Tomato baskets are shallow – water retention is important! Choose a good potting mix or make your own. Peat moss, vermiculite, and perlite in potting mix hold water well. Don’t sow seeds directly in hanging tomato baskets – germination and maturation take too long. 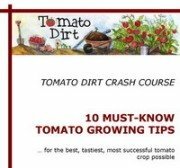 Buy tomato seedlings or start them indoors earlier in the spring. Even tomatoes with shallow root systems grow aggressively beneath the soil. Plant just one seedling per basket to allow for growth. The basket may look too big for one lone seedling, but resist the temptation to fill in the basket with extra plants. The seedling will fill out and spread soon enough. Bury part of the seedling stem to encourage quick root production off the stalk. Most basket varieties are determinate. They’ll produce fruit for a short time – a couple of weeks – and then stop growing. Extend your harvest by planting tomatoes in baskets at intervals so fruit matures over a longer length of time. Or plant different varieties to allow for a longer harvest. Baskets are shallow – they dry out quickly and get stressed in excessively hot temperatures. If you live in a warm climate, plant your basket early so you can harvest tomatoes before the season gets too hot. When spring nights are cool and days are wet, bring baskets inside until plants get established. Make sure it receives at least 6-8 hours of sun a day. If your hanging tomatoes are positioned on a porch or near an overhang where it may be partly shaded at different times during the day, rotate it. Check your basket each day to keep soil evenly moist. Use tomato fertilizer to feed it, since frequent watering leaches nutrients from the soil!